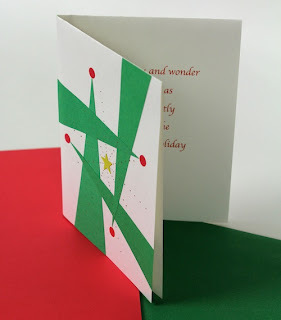 The simple Christmas Tree form is the most common one used in my card designs and I find I continually gravitate toward it when designing new ones. I expect it is because it is much easier to create a dynamic graphic design from the basic triangle form than any of the other Christmas symbols. It is also easy to cut! This fifth group of cards is all based on the tree theme and they just didn' fit into other groups. The uniqueness of this design is in the initial fold of the paper. With most cards I fold the paper in half and then in half again. For this one, I cut a long triangle and folded it in a zig-zag using that to create the mountain slope. I am sure this isn't original but it is from 1993 so I certainly don't remember where the inspiration came from. 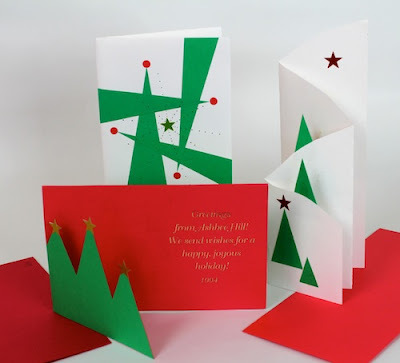 It is a quick and easy handmade card design. I have never tried to name my card designs but found it necessary for this series of posts. 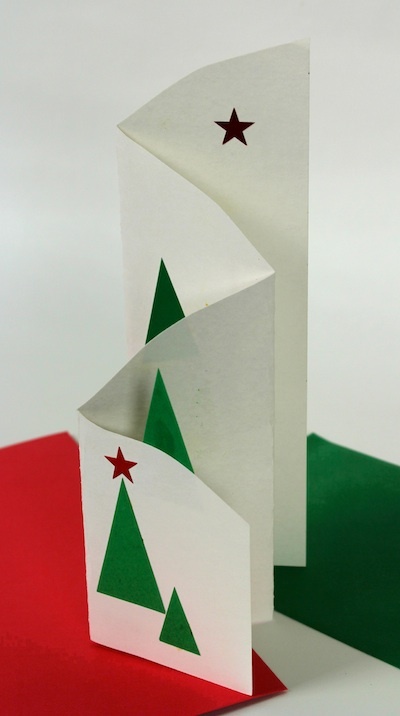 The design from 1993 was created simply by gluing red and green paper back-to-back, folding and cutting the trees. This one is interesting because that year there was a new technique to use your laser printer to apply gold ink. The gold ink would stick to the black laser ink. It was experimenting with that process that lead to this design. Failure rate was high on the gold ink part. 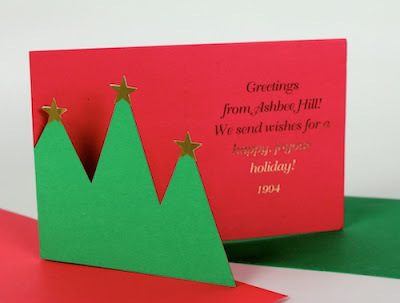 The inside was printed on plain red paper before the card was crafted. My design for 2004 was based on the sentiment written inside. It says,"May the joy and wonder of Christmas shine brightly through the chaos of the holiday season." I worked to create a design, based again on the tree, that reflected beauty in the chaos. This is another of my favorites.